Das ist die Fortsetzung meines letzten Eintrags zu Tom Jones. Ich sammle hier vor allem Textstellen, die ich mir merken möchte. Partridge, ein in mancherlei Hinsicht etwas naives Schulmeisterlein, besucht mit den anderen Charakteren eine Aufführung von Hamlet. Der Geist von Hamlets Vater erschreckt ihn furchtbar, die berühmte Totengräberszene dagegen nötigt ihm wenig Respekt ab: Partridge war im Lauf seiner wechselhaften Karriere auch Kirchendiener, hat Erfahrung mit der Totengräberei und moniert sofort, dass dieser Totengräber auf der Bühne da keine Ahnung vom Umgang mit einem Spaten hat. Hier rechtfertigt sich der Erzähler dafür, dass er in seiner history bestimmte Dinge weglässt: Zu groß die Versuchung für den Leser, die Stellen einfach zu überspringen. Auch in England gab es anscheinend die Diskussion um den Hanswurst (Wikipedia), die unsere Schüler vielleicht kennen aus Lessings 17. Literaturbrief, in dem Lessing klagt: „[Gottsched] ließ den Harlekin feierlich vom Theater vertreiben, welches selbst die größte Harlekinade war, die jemals gespielt worden“. Ein Marionettentheater kommt in den Gasthof, in dem Tom Jones übernachtet, und Tom schaut sich die Aufführung an. Das landfeine Publikum lobt, dass nichts Anstößiges, Derbes, Zweifelhaftes, ja auch nur Komisches mehr im Stück verblieben ist, während Tom dem Punch, dem englischen Hanswurst nachtrauert. Before our travellers had finished their dinner, night came on, and as the moon was now past the full, it was extremely dark. Partridge therefore prevailed on Jones to stay and see the puppet-show, which was just going to begin, and to which they were very eagerly invited by the master of the said show, who declared that his figures were the finest which the world had ever produced, and that they had given great satisfaction to all the quality in every town in England. The puppet-show was performed with great regularity and decency. It was called the fine and serious part of the Provoked Husband; and it was indeed a very grave and solemn entertainment, without any low wit or humour, or jests; or, to do it no more than justice, without anything which could provoke a laugh. The audience were all highly pleased. A grave matron told the master she would bring her two daughters the next night, as he did not show any stuff; and an attorney’s clerk and an exciseman both declared, that the characters of Lord and Lady Townley were well preserved, and highly in nature. Partridge likewise concurred with this opinion. Und hier ein langes, ausgeführtes Bild um „the artillery of love“. Mrs Waters versucht unseren Helden Tom Jones zu verführen. Fielding beschreibt das, unter Musenanruf, in den Vokabeln einer Feldschlacht. 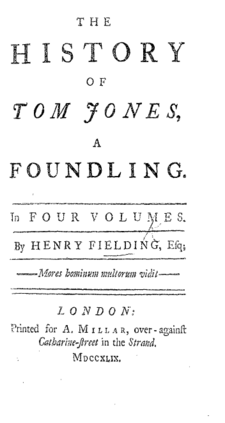 Vor den „pointed ogles“ schützt Tom Jones das Stück Fleisch, das er gerade verschlingt, vor den „deadly sighs“ das Glucksen aus der Bierflasche, aber über kurz oder lang erliegt Tom dem „volley of small charms“ und es, äh, kommt, wie es kommen muss. In short, all the graces which young ladies and young gentlemen too learn from others, and the many improvements which, by the help of a looking-glass, they add of their own, are in reality those very spicula et faces amoris so often mentioned by Ovid; or, as they are sometimes called in our own language, the whole artillery of love. Now Mrs Waters and our hero had no sooner sat down together than the former began to play this artillery upon the latter. But here, as we are about to attempt a description hitherto unassayed either in prose or verse, we think proper to invoke the assistance of certain aërial beings, who will, we doubt not, come kindly to our aid on this occasion. „First, from two lovely blue eyes, whose bright orbs flashed lightning at their discharge, flew forth two pointed ogles; but, happily for our hero, hit only a vast piece of beef which he was then conveying into his plate, and harmless spent their force. The fair warrior perceived their miscarriage, and immediately from her fair bosom drew forth a deadly sigh. A sigh which none could have heard unmoved, and which was sufficient at once to have swept off a dozen beaus; so soft, so sweet, so tender, that the insinuating air must have found its subtle way to the heart of our hero, had it not luckily been driven from his ears by the coarse bubbling of some bottled ale, which at that time he was pouring forth. Many other weapons did she assay; but the god of eating (if there be any such deity, for I do not confidently assert it) preserved his votary; or perhaps it may not be dignus vindice nodus, and the present security of Jones may be accounted for by natural means; for as love frequently preserves from the attacks of hunger, so may hunger possibly, in some cases, defend us against love. The fair one, enraged at her frequent disappointments, determined on a short cessation of arms. Which interval she employed in making ready every engine of amorous warfare for the renewing of the attack when dinner should be over. No sooner then was the cloth removed than she again began her operations. First, having planted her right eye sidewise against Mr Jones, she shot from its corner a most penetrating glance; which, though great part of its force was spent before it reached our hero, did not vent itself absolutely without effect. This the fair one perceiving, hastily withdrew her eyes, and levelled them downwards, as if she was concerned for what she had done; though by this means she designed only to draw him from his guard, and indeed to open his eyes, through which she intended to surprise his heart. And now, gently lifting up those two bright orbs which had already begun to make an impression on poor Jones, she discharged a volley of small charms at once from her whole countenance in a smile. Not a smile of mirth, nor of joy; but a smile of affection, which most ladies have always ready at their command, and which serves them to show at once their good-humour, their pretty dimples, and their white teeth. Here, reader, I beg your patience a moment, while I make a just compliment to the great wisdom and sagacity of our law, which refuses to admit the evidence of a wife for or against her husband.